I thought a cocktail was far more fitting that champagne this Monday morning, seeing how I’m celebrating the fact that I have all of my cookbook photos in to my publisher. By all of my photos, I mean a good 99% of them as I am learning the fluidity and malleability of the cookbook process. Photos can be pulled and replaced at a later time if I need to update them before the printing process if I decide to change something or am not happy with what is there. The cookbook timeline needed a hard stop for a date, but I am lucky enough that the creative process with my amazing cohorts in cookbook crime (AKA Robert and Lindsay from appetite: Random House) has been nothing short of amazing and inspiring. I have design mock-ups that literally make me tear up as the design team absolutely nailed what I was looking for. This cookbook is going to be so beautiful, so gorgeously photo laden and visually interesting that I am wired with anticipation. That said, taking on the photography yourself is a crazy endeavour plus a massive amount of work, and I am glad that most of it is behind me. Oh I know that I still have photos that will need to be redone or replaced, but that’s ok.
It’s still time to celebrate with a drink! I’ll share with you my Halloween cocktail that I made this past Saturday for all of my guests, to rave reviews. The triple trouble that you need to make this cocktail are your favourite apple cider, an apply brandy or whiskey and Sortilege. 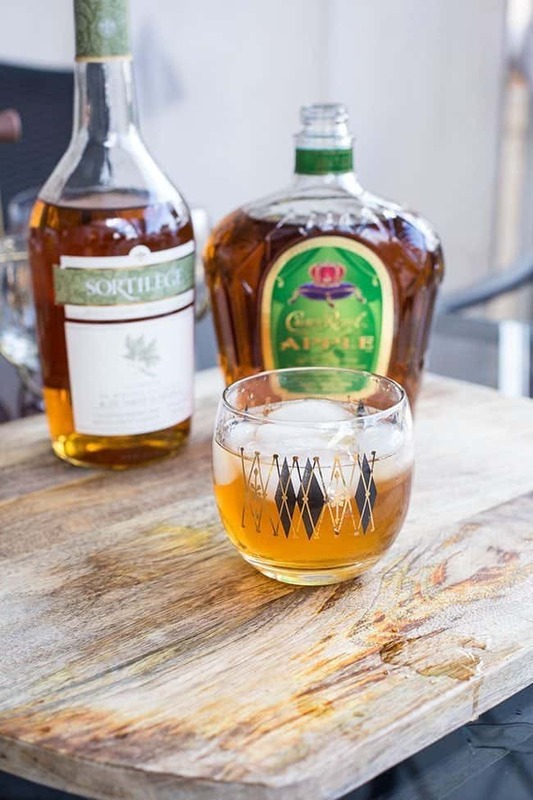 While you can definitely play around with apple brandy or whiskey, you simply cannot replace the Sortilege with a maple whiskey. There is never enough maple flavour and the Sortilege is smoother than any whiskey will ever be. I was also very excited to bring out my newest set of retro barware. 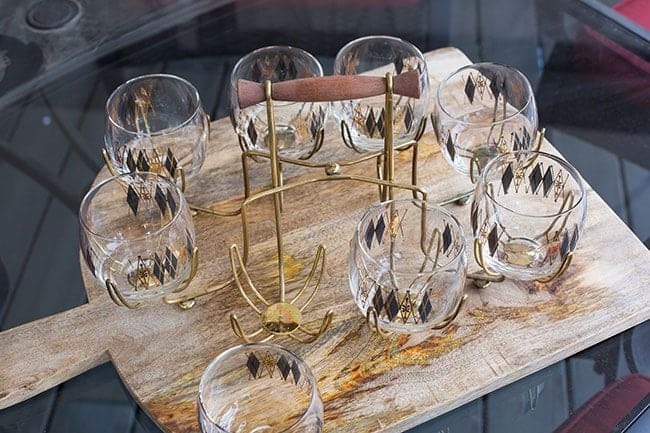 I have three full sets (not counting any prop glasses that I also own) of in-the-original-holder mid century modern glasses. This one that I scored for $20 is my absolute favourite.I’ve never seen a holder that has the individual arms holding each glass. It’s so atomic/space age awesome. I was told that it’s by Federal Glass, but since there isn’t any markings I couldn’t verify this for certain. 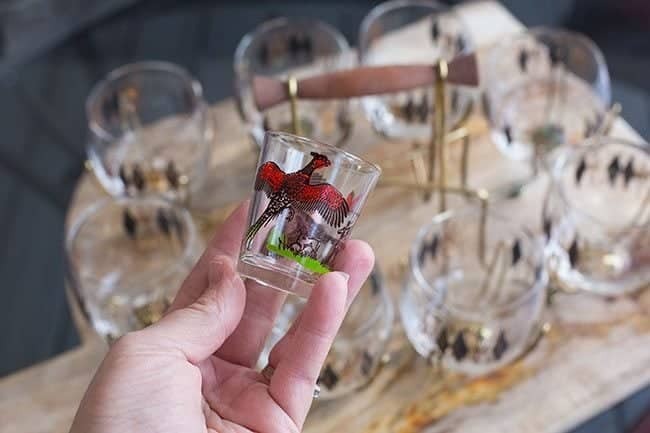 My favourite shot glass however, is by Hazel Atlas in their pheasant and hunter pattern. I’ve managed to thrift four glasses so far and when I get up to eight I’ll be able to pull them out at parties as well. 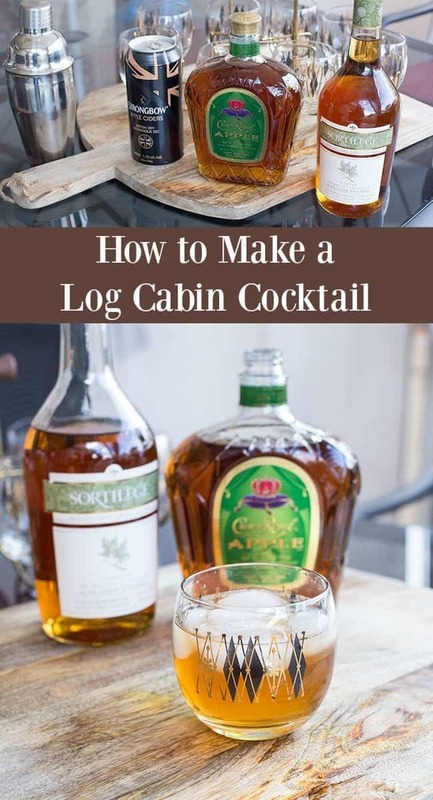 The Log Cabin cocktail is a deliciously sweet and strong concoction that truly embodies everything Canadian. Whiskey. Apples. Maple syrup. Ice. The only incongruent ingredient would be the splash of lemon juice at the end. While I do have it listed as an option, only one person at my soiree preferred their Log Cabin without that dollop of acidity. It perfectly cuts the sweetness and balances out each and every sip. As much as I love winter, I don’t love many hot cocktails, excepting boozy hot chocolate. 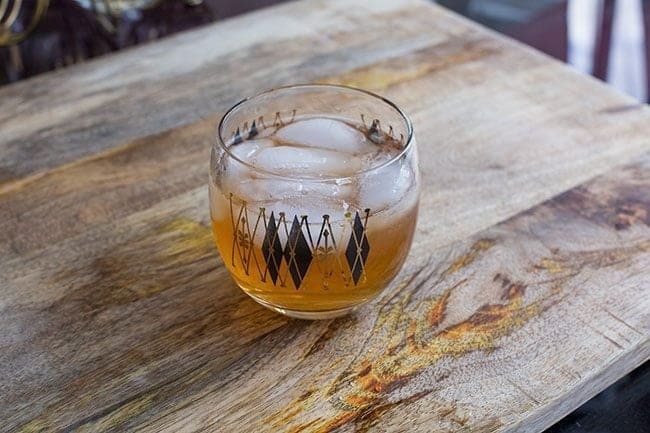 I still like a cold, icy cocktail during the winter months and the Log Cabin cocktail perfectly combines the flavours of the season. So let’s raise our glasses to me finishing my cookbook photos, to a fabulous November and to great Canadian cocktails! This amazing maple flavoured, sparkling cider drink will soon become your new favorite cocktail! Combine the liqueur, brandy/whiskey and 1/4 ounce of the lemon juice in a cocktail shaker filled with ice and shake until the shaker is cold to the touch. op with the sparkling cider, and gently stir to combine the cocktail. Serve and enjoy! Ooh! I do know that they are Federal Glass. Best $20 I’ve ever spent, I’ve never found another holder like it! I sold everything I had in that pattern to Natalie’s mom Ronit. She has my entire stash! I loved it but I love so many patterns. It’s a gooder! Natalie Mitchell They are my favourite roly poly’s. So much that I won’t use them other than photos hahah! Try that big wine store of yours, Total Wine! They had the liqueur! It’s one of my favourites! The set and the caddy ( holder) are amazing! I so want to be a guest at your cocktail parties! I have house bar plans to do this winter…we’ll see if I have time to get it done! love the look of this! 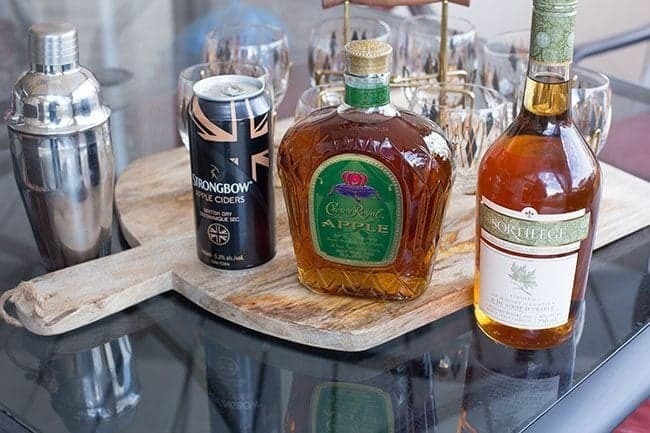 Have the cider and Sortilege … is the crown royal apple sweet or no? Been wanting to try it since I saw it! A few well selected hard alcohols can yield some pretty amazing drinks on the fly! And if you always have bottled lemon and lime juice? Always something to whip up! It’s the fresh fruit that’s hard to always have on hand. I think I need to invest in a more diverse liquor cabinet. All your drinks look amazing!